Samuel Kosgei and Marion Kandie win the men's and women's races at the second annual Overland Park Double Road Race; Peter Mullin captures the Double Victory Cup for best age-graded performance. 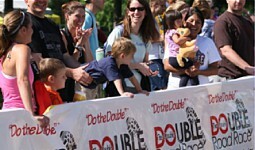 Two Africans now living in the US and a Texas oil engineer who travels the world were the big winners as the Double Road Race returned to Overland Park, Kan., Sun., June 29, where Bob Anderson, creator of the Double, grew up and first started Runner's World magazine in 1966. Samuel Kosgei, 30, a native of Uganda who now lives in Junction City, Kan., was a runaway winner in the men's race at the second annual Overland Park Double as he led every step of the way in running the opening 10K leg in 32:08 and the concluding 5K leg in 15:35. His aggregate time of 47:44 ultimately gave him a winning margin of two minutes, 43 seconds. The 5'6", 121-pound Kosgei, who was a two-time All-American at Lamar University in Texas, where he set personal bests of 13:35 for the 5000 meters and 28:32 for the 10,000 meters, is now in the US Army in Fort Riley, Kan., and lives with his wife Merty and their little boy, Brian, who's about to turn three, in nearby Junction City. Before the race, little Brian told his father, "Daddy, I want you to run fast and win." Finishing second in the men's race in Overland Park was Samuel Kosgei's teammate on the Fort Riley military team, Cosmos Sigei, 31, who's from Kenya and also lives in Junction City. 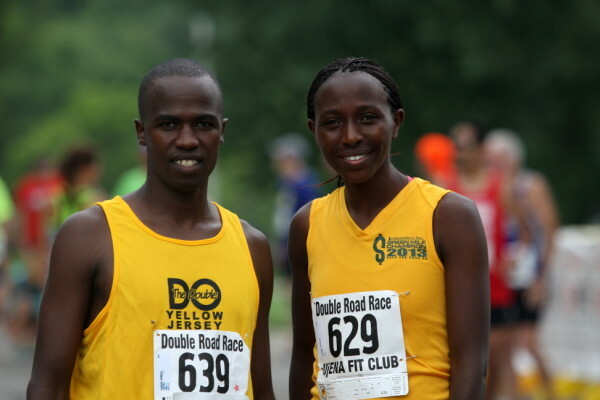 Sigei ran the 10K in 34:01 and the 5K in 16:26 for a combined time of 50:27. Rounding out the top three in the men's race was Aaron Davidson, 29, of Lenexa, Kan., who clocked 34:36 in the 10K, which was 35 seconds slower than Sigei's time, but then completed the 5K in 16:18, eight seconds faster than Sigei. Unfortunately, Davidson's combined time of 50:56 wasn't fast enough to overtake Sigei for second place on aggregate time. Still, he had the consolation of having posted the second fastest time in the concluding 5K leg. After his victory on Sunday, Samuel Kosgei said, "I actually ran basically alone from the gun. I only had a few guys with me for the first mile and then I was on my own. I didn't do anything to drop anyone, but I just set a pace that I thought I could maintain. I could have run faster, but it's hard to push yourself when you're on your own. "A win is a win, and although I didn't run a fast time, it's good to be competitive, and what I wanted to do is win, which is what I did." Speaking of the Double itself (this was the first time he had run the event), he said, "I think it's a good race to be in. It's a unique competition and it prepares you mentally, because when you're running the 10K, you have to focus on that and you can't be thinking of the 5K or saving anything for the 5K, but you still have the 5K to run afterwards. Actually today the 5K felt easy (for me). My body was warm and my muscles felt loose. I'm sure if I had someone to push me I could have run faster. (The Double) is more challenging than a straight race, but I had fun." The winner of the women's race in the Overland Park Double was Kenyan native Marion Kandie, 29, who now lives in Bowling Green, Ky. She also led from start to finish in both the 10K and 5K to post an aggregate time of 56:41 (37:50 10K and 18:51 5K). Her ultimate margin of victory was even larger than Kosgei's in the men's race - she won by five minutes, 36 seconds! Shanin Howard, 35, of Kansas City, Mo., finished second in the women's race, running the 10K in 42:24 and the 5K in 20:52 for a combined time of 1:03:17. Master's runner Cindy Cameron, 49, of Westwood, Kan., was third with an aggregate time of 1:03:41. She ran the 10K in 42:57, some 33 seconds slower than Howard, the second-place finisher in the 10K. Then she actually outran Howard by nine seconds in the concluding 5K, running 20:43 compared to Howard's 20:52, but it wasn't enough to overtake Howard on aggregate time. Neither Kosgei nor Kandie came close to the world records in the Double. Julius Koskei of Kenya holds the men's world record in the Double - 44:24 (29:45/14:39). Molly Pritz, originally from Pennsylvania but now living in the San Francisco Bay area, holds the women's world record - 52:13 (34:39/17:34). Ironically, Samuel Kosgei and Julius Koskei are from the same tribe - the famous Kalenjin tribe that has produced all those world-beating runners. The main distinction between Samuel and Julius is that one comes from a high-altitude area in Uganda near the Kenyan border, the other is from Kenya itself, and they speak different dialects. Incidentally, the first Double Road Race in Kenya will be held on Sept. 6 in Thika, which doesn't have as many elite runners as the Eldoret area, but as Samuel pointed out, "If there's prize money, they will come (the runners from Eldoret)." He also felt that even at altitude, the world record would be in jeopardy. Prompted further by the reminder that Julius Koskei's world record is the aforementioned 44:24 (29:45/14:39), Samuel said with certainty, "That's going to fall in Thika then. Because those guys can run 28:50 something and come back and run the 5K in around 14:20." While Samuel Kosgei and Marion Kandie were the men's and women's race winners in Overland Park, the most prestigious award went to Peter Mullin, 63, the oil engineer from Houston who's carving out quite a career for himself not only as a Master's runner but also as a Double Road Race competitor. He won the 60-64 age group in Overland Park by a huge margin, posting an aggregate time of 57:14 as he ran the 10K in 38:19 and the 5K in 18:54. More importantly, this earned him the Double Victory Cup for best age-graded performance in the race as his 57:14 translated to a score of 91.64. It was the second time Mullin has won the Double Victory Cup in the Double. There were many other notable performances in the Overland Park Double, but two of them deserve special mention. As it so happens, they were posted by competitors at opposite ends of the age spectrum. Lucy Harding, who's only nine years old and runs with a Native American running group in nearby Lawrence, Kan., ran the 10K in 52:18 and the 5K in 27:07 for an aggregate time of 1:19:25! For a nine-year-old, that's impressive to say the least. Bob Anderson, who created the Double Road Race, was back in Overland Park, where, as previously mentioned, he grew up and started Runner's World, to complete his 21st Double. He posted an aggregate time of 1:12:58 in finishing fourth in the 60-69 age category and kept his string alive of having completed every Double ever held - and with every passing Double, this unbroken string is beginning to look more and more like an ironman streak! Sunday's race was held under the variable weather conditions typical of Kansas at this time of year. The first half of the 10K was run in cooler temperatures because of the early morning start, but the second half of the 10K was "brutal," in Bob Anderson's words, as the sun came out so it was hot and humid. By the time of the 5K, however, the sky had become overcast and the temperatures cooled down. The award for the fittest team in the race, which goes to the team with the most finishers, was won by a Kansas City area team called Scrambled Legs (good name!). The team had a total of 18 finishers in the Double and the other races on the program.